Once a consumer enters our program, they are assigned to a Vocational Case Manager who provides them with support throughout the individual’s work program. 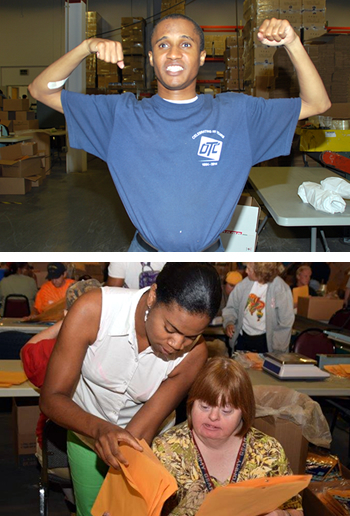 The goal is to give adults with disabilities the training and support they need to establish and maintain healthy work habits that will follow them throughout their vocational career. Together, the consumer and their case manager talk about the consumer’s interests, they help develop goals, and discuss observed and expected progress associated with the program. The vocational case manager is responsible for observing and recognizing both the successes and challenges of each consumer and encouraging the development of interpersonal and work skills as the individual progresses through the training. All of our vocational case manager are aware that stresses from outside of the workplace can often interfere with progress in training. As a result, if any personal issues begin to interfere with an individual’s performance, the vocational case manager may offer support and referral if they believe it will help with the individual’s work. We love to see our consumers succeed and provide every possible opportunity for them to flourish in our programs as well as their future employment opportunities.